Tomorrow evening represents a huge technological change for football fans as we see the Ukraine v England World Cup qualifier this Saturday become an Internet only event. The move follows the collapse of the television company Setanta who previously had the rights to the game after no alternative agreements with conventional broadcasters were reached. Personally, I don’t fancy the idea of sitting in front of a laptop, dressed in full England Away Kit, by myself. Half the experience is surely either the pub atmosphere or having the game played on a big screen with a couple of mates and I genuinely wonder how many people will stump up the £11.99 subscription fee (£4.99 if paid two days in advance). The idea that one method of watching the game is so palatable and one so disagreeable got me thinking about how our opinions of these two types of media are so different. In theory our computer and our television should already be firmly linked to one another; most homes have super fast broadband which are ideal for on-demand services such as football matches, music videos and films. We have still however managed to inexplicably distance the two technologies to the point that the thought of a football game being broadcast over the Internet only verges on lunacy. There have been some steps to combine the two technologies. A service that interests me is BT Vision which provides a hybrid box which allows you to receive digital freeview channels over the airwaves and on demand media via the home broadband connection. I see this as being one to watch and hopefully companies such as Sky will start offering similar in the future. Many people have also already connected their computers to their TV’s to watch the occasional downloaded movie however to take things to the extreme you could always consider setting up your computer as a home media centre. A piece of free Windows based software I’ll be looking at today called ‘Media Portal’ allows you to do just that, allowing you to integrate your computer in to the centre of your living room with the minimal of fuss. MediaPortal (www.team-mediaportal.com) is a 30mb open source application ideally suited to a smaller machine which could be positioned in close proximity, permanently connected to your main TV. Of course, how you set it up is completely up to you; if you didn’t own a TV then the application would function just has happily on a standalone laptop. It is designed to allow your computer to record and rewind live digital TV, watch movies, view photo’s, reply to your e-mails and catch up on news and weather feeds. If you download and store a large amount of music you will appreciate the ability to search for any music track on your hard drive or sort the tracks by name, artist or album. 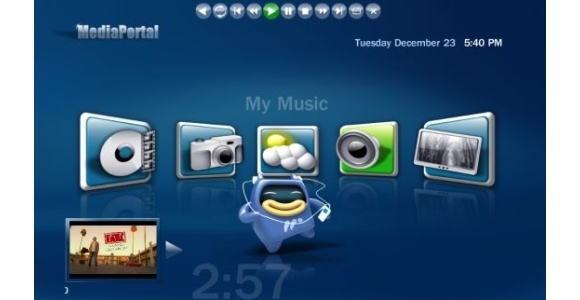 Conventional FM radio along with DVB and Internet radio are also supported. One of the main sticking points for a device that is attempting to assert itself in the living room would be if the interface was hard to use and you had to get up and use a keyboard / mouse whenever you wanted to change channel. Fortunately, support for a number of remote control devices is also provided and all the main application functions can be accessed from the easy to use interface which can be set to load automatically whenever the machine is turned on.